It turns out, reveals Le Monde, that Alain Juppé, France's new defense minister (François Fillon's entire government was renewed last weekend) heading to the NATO talks in Lisbon, was one of the politicians expressing skepticism in 2008 and 2009 with the idea of having France return to the integrated command in the organization out of which Charles de Gaulle pulled France in 1966. A peine nommé, le nouveau ministre de la défense français est attendu au sommet de l'OTAN, qui se tient à Lisbonne pour deux jours, à partir de vendredi. Une coïncidence cocasse, quand on sait qu'Alain Juppé avait critiqué le retour de la France au sein du commandement de l'alliance atlantique. Le maire de Bordeaux, quand il avait pris du recul vis-à-vis de Nicolas Sarkozy, s'était montré peu avenant à l'égard de la politique de défense du chef de l'Etat. En février 2009, dans une tribune au Monde, il se demandait : "La France a-t-elle intérêt à réintégrer en 2009 le commandement militaire de l’OTAN qu’elle a quittée en 1966 ? La question n’est pas sacrilège. Nul ne sait comment le général de Gaulle y répondrait aujourd’hui." Annoncée disparue par Le Canard enchaîné de mercredi, la note qui reproduit ce texte est toujours consultable sur le blog de l'ancien premier ministre. Le bien-fondé du rapprochement de la France et de l'OTAN, dominée par les Américains, a été mis en cause plusieurs fois, sur divers tons, par Alain Juppé : "Je me demande si on n’est pas en train de faire un marché de dupes en rentrant sans conditions", avait-il lancé en juin 2008 lors d'une conférence. Peu après cette sortie, il avait toutefois estimé sur son blog que Nicolas Sarkozy avait répondu de façon convaincante à ses inquiétudes. Pourtant, deux ans plus tard, en mai, Alain Juppé fait de nouveau part de ses doutes : "Je ne suis pas sûr qu'on ait gagné à perdre notre position originale", estime-t-il, dans un entretien à la revue Défense cité par le Nouvel Observateur. Malgré les promesses de Nicolas Sarkozy, "il n'y a pas eu d'avancement sur le plan de l'Europe de la défense", ajoute-t-il. In the wake of the French government's resignation last weekend, write Nathalie Guibert and Natalie Nougayrède in Le Monde, a couple of nominations in the new administration (François Fillon stays on as prime minister) show the country's turn towards the Gaullist right. Two people affiliated with Jacques Chirac — Alain Juppé and Michèle Alliot-Marie — have been elevated to the helms of, respectively, the defense and the foreign affairs ministries. Une nouvelle tonalité pour l'action extérieure de la France ? Les nominations de deux personnalités chiraquiennes de filiation, Alain Juppé à la défense, et Michèle Alliot-Marie aux affaires étrangères, confèrent un affichage plus "gaulliste" à la diplomatie du pays. Depuis 2007, Nicolas Sarkozy avait imprimé un tournant atlantiste. Le retour dans le commandement intégré de l'OTAN, l'emploi de la notion de "famille occidentale", le rapprochement avec l'Amérique de George Bush, le réchauffement des relations avec Israël, avaient composé ce nouveau paysage. Bernard Kouchner, au Quai d'Orsay, était pleinement en phase avec ces choix, au-delà de ses tensions chroniques avec les conseillers de l'Elysée. Mais l'impression de virage "néogaulliste" doit être relativisée. … Peu d'observateurs s'attendent à ce que les choix opérés depuis 2007 soient inversés. Le nouveau ministre de la défense ne reviendra pas sur le fond. Ignoring the Ramifications of the Viktor Bout Case, Apologizer-in-Chief Calls Russia "a Partner, Not an Adversary"
… just as the United States and Russia have reset our relationship, so too can NATO and Russia. In Lisbon we can make it clear that NATO sees Russia as a partner, not an adversary. We can deepen our cooperation on Afghanistan, counter-narcotics and 21st century security challenges — from the spread of nuclear weapons to the spread of violent extremism. And by moving ahead with cooperation on missile defense, we can turn a source of past tension into a source of cooperation against a shared threat. As Barack Obama heads to Europe for his second visit abroad since the mid-terms shallacking, the Apologizer-in-Chief has authored another feel-good homily for the benefit of the European allies — something that is far easier to do if you ignore the ramifications linked to the case of Viktor Bout — which promptly made (a huge headline on) the front page of Le Monde. "Notre relation avec nos partenaires et alliés européens est la pierre angulaire de notre engagement dans le monde" affirme le président américain dans une tribune au journal Le Monde sur le sommet de l'Alliance. What happens if Barack Obama keeps U.S. troops in Afghanistan for the long haul, modernizes the American nuclear infrastructure as a counterweight to the signature of the New Start treaty with Russia, and gets tough — real tough, going beyond sanctions — on Iran? The president gets stand-up support from a group of Republicans who are concerned about a potential wave of isolationism coming from “an unholy alliance” of right- and left-wing outriders in Congress who disdain the country’s engagement in the world. Of course, some not-so-small fine print slips in here: A second-term Obama White House, in this view, also presupposes an economic rebound and avoiding a major terrorist attack. But Senator Lindsey Graham of South Carolina — described by Bob Woodward in his book “Obama’s Wars” as regarded by Mr. Obama as “the most reasonable Republican ally” on issues like Afghanistan — is saying these days that his party’s ascension in Congress can mean foreign policy support for the president in exchange for clear demonstrations of a new firmness, particularly on Iran. … according to Mr. Graham, the Republican notion of a swap in their cooperation with the president involves Mr. Obama’s “need to start talking more openly” about possible military solutions. “That’s what I mean by being tough,” the senator said. It's clear that hating happy, normal people makes him "feel smart." It also validates the idea to themselves that they are apart and above others. It is a defense against the possibility of anyone you disagree with ever being right about anything. 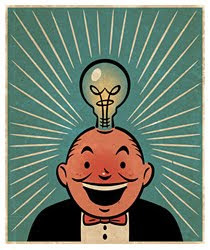 It is an inversion of the humanistic reasoning that the hater claims to have a monopoly on. Who knew this information, why have they been hiding it? We look back on the late 1990s as a rare time when the federal government ran budget surpluses. We tend to forget that those surpluses came as a surprise to almost everybody. As late as 1998, the Congressional Budget Office was predicting a deficit for 1999. In fact, Washington ran its biggest surplus in five decades. What happened? Above all, economic growth. And that may be a big part of the answer to our current problems. Almost one year after it was published, Cathal Kelly's Star article is more relevant than ever (toda raba to Hervé). …in a nutshell … "Israelification" [is] a system that protects life and limb without annoying you to death. …All drivers [coming to Tel Aviv's Ben Gurion International Airport] are stopped and asked two questions: How are you? Where are you coming from? Armed guards outside the terminal are trained to observe passengers as they move toward the doors, again looking for odd behaviour. …Five security layers down: you now finally arrive at the only one which Ben-Gurion Airport shares with Pearson — the body and hand-luggage check. …[All this] doesn't begin to cover the off-site security net that failed so spectacularly in targeting would-be Flight 253 bomber Umar Farouk Abdulmutallab — intelligence. In Israel, Sela said, a coordinated intelligence gathering operation produces a constantly evolving series of threat analyses and vulnerability studies. …So. Eight years after 9/11, why are we still so reactive, so un-Israelified? Ireland's day of reckoning has arrived. When Brian Lenihan meets his fellow European Union finance ministers in Brussels Tuesday, he will find himself in the surreal position of being begged to accept a European Union bailout, despite the fact Ireland doesn't need to tap bond markets until the middle of next year and his government will next month deliver a budget which it believes will enable the country to bring its borrowing under control. But this crisis is now about the survival of the euro zone. Mr. Lenihan should take the money — and the rest of Europe must hope that does the trick. No need to worry, our betters are obviously on top of things. The US military using force against the imaginary “martyr,” Julian Assange? Grow up! 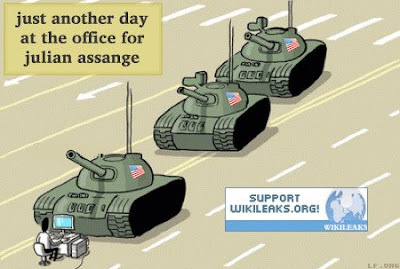 Assange should be shown driving the armor on behalf of the world’s mass-murdering tin-pot strogmen. After a debate which virtually ripped apart the NP editorial offices, we have decided to open up the following unedited and shocking video for the thoughts of our readers. Is it high art? A complex reading of contemporary mores? A stupid video with no redeeming qualities? You the reader decide.